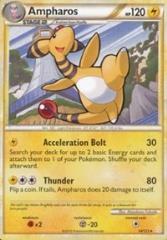 Attack 1: [L] Acceleration Bolt (30) Search your deck for up to 2 basic Energy cards and attach them to 1 of your Pokemon. Shuffle your deck afterward. Attack 2: [2L] Thunder (80) Flip a coin. If tails, Ampharos does 20 damage to itself.